1. Start out by preheating the oven to 350degrees. 2. Mix the shortening and sugar together. 3. Add the eggs, salt, baking powder, vanilla and anise seeds and mix. 3. Mix in the flour until well combined. It will be sticky. 6. Let it cool for about 5 minutes, and then transfer to a cutting board. With a sharp knife cut into about 3/4" strips like so. 7. 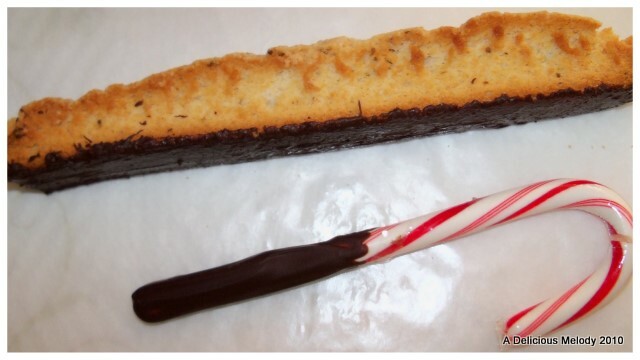 Continue to cut the biscotti. Don't fret if the top cracks a little. It's all good...and goes with the territory. Yum. Yum. Yum. Dip them. Dunk them. Nibble or chomp. They will be crispy, crunchy, sweet anisey goodness! :) Enjoy!! !